A listening and writing exercise using "he looks + adj"
1. This is basically just a listening quiz. Before class, decide on your answers. Match each face with a name. When you perform the quiz, make a sentence with each pair, e.g. "Taro looks angry." 2. Hand out the worksheet, and have the students draw lines from the names to the faces, as you announce the sentences. 3. Go over the answers on the blackboard. 4. Have the students turn over the paper and write the sentences corresponding to the answers. 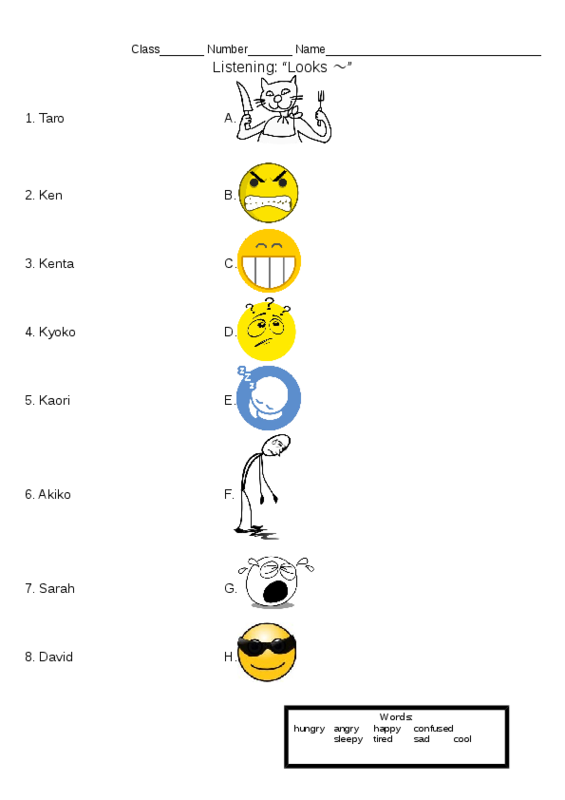 Worksheet made from Patrick Bickford's "Looks Faces" on Englipedia.